The infamous Bay Area has a long and extensive metal history. Responsible for many of metal's most trendsetting acts (just think of EXODUS, TESTAMENT, FORBIDDEN, HEATHEN or BLIND ILLUSION) for over three decades now, the city by the bay has spawned some of the most innovative and exceptional talents there is. HEXX, one of the third-generation power metal bands emerging from San Francisco, were formed in late 1984. Their first album entitled No Escape was released only in the United States (by the legendary Shrapnel label) and began shaping a steadily growing fan base for the band. It was followed by Under The Spell and Quest For Sanity marking the end of HEXX Mark I. At that time, internal changes were taking place within the ranks of HEXX that would alter their musical direction. On the strength of a song called "Watery Graves" (released as an EP on Wild Rags Records), HEXX signed to Century Media Records. The following album, 1991's Morbid Reality, marked HEXX's evolution from a more or less traditional speed/power metal band to a brutal, technically-inclined thrash/death metal outfit. 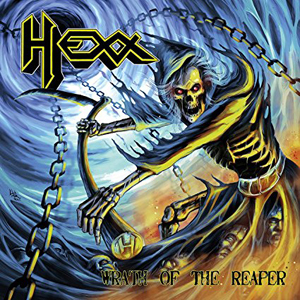 With Wrath Of The Reaper, HEXX are returning to their traditional power metal roots. "Perhaps HEXX phase three is a good way to describe it," says founding member and guitarist Dan Watson. "This record is mostly rooted in our old power metal style of our first two albums but there is a track on the album called "Exhumed For The Reaping" that has a lot of very fast riffs that almost sound like it could have been from our speed/thrash metal era. Eddy's vocals are very high and melodic, so it still sounds like very fast power metal and not like true thrash metal. We consciously tried to take what we thought were the best elements and style of our first two albums No Escape and Under The Spell and use that as the mainframe feel and vibe for this record. I think there are slight elements echoing back to Quest For Sanity as well in some songs. We think this new album is by far our best offering."